Documentary ‘Max Reger – The Last Giant’, directed by Will Fraser, and performances by various artists including Bernhard Buttmann, Bernhard Haas & Graham Barber (organ), Egidius Streiff & Katharina Wildermuth (violin), Markus Becker & Rudolf Meister (piano), Frauke May (mezzo-soprano), Julius Berger (cello), Roland Glassl (viola), Aris Quartet, Diogenes Quartet, Hyperion Trio, Brandenburgisches Staatsorchester/Ira Levin, WDR Funkhausorchester/Wayne Marshall. Filmed at the Royal College of Music, London, and at various venues in Germany. The centenary of Max Reger’s death, which fell in 2016, was barely marked in the English-speaking countries. All that I noticed in Britain was a slow performance of the Mozart Variations at the Proms, with massive gaps between the variations. Any residual resentment has been thoroughly assuaged by this magnificent set of DVDs from the film-maker Will Fraser. When it was first mentioned to me, it came as a bolt from the blue – I had to pinch myself a few times to ensure that I was not dreaming. I now know it has been crowdfunded. Had I been asked at the time, I would definitely have contributed, but that would have disqualified me from reviewing it. As it is, I can confidently say that if you have any interest in the music of the first 17 years of last century, you should buy this set. Mortgage your house, sell your relatives into slavery, but get it! First, a few generalities about what we are offered in this cornucopia. Three of the six discs each feature one section of a three-part, 210-minute documentary, plus filmed performances. The other three are totally devoted to performances. In the course of our journey, we get acquainted with Reger’s often-tumultuous life and are led through various works from his large oeuvre – which totals around 1,000 works in 147 opuses – in order of their composition. The performers are all first rate and with minor blips, noted below, the performances are superb, helping to show Reger in the best light. The main thread of the documentary is a long conversation between the mezzo-soprano Frauke May and Dr Susanne Popp of the Max-Reger-Institut, a leading Reger scholar and a most sympathetic personality. We also hear from the Institut luminary Dr Jürgen Schaarwächter, another pleasing chacter who wears his learning lightly. Frauke May, who performs all the songs that we hear, clearly knows a great deal about Reger and often chips in with shafts of enlightenment, as do other performers such as the organist Bernhard Haas and the pianist-conductor Ira Levin. Disc 1: The first part of the documentary deals with Reger’s Bavarian childhood and adolescence, his early struggles and setbacks, his drinking – a Leitmotif throughout his adulthood – and his gradual emergence. Getting a little ahead of himself, Haas points out that in the years 1901-5 Reger was ‘at the top of the avant-garde’. We see snippets of performances which will later be heard in their entirety, and some of the performers make telling points. The rest of the disc consists of the three Fantasies for organ, Op. 52. Bernhard Haas, the only organist to perform from memory, plays ‘Alle Menschen müssen sterben’ on the Walcker instrument of the Stadtkirche, Ludwigsburg; Bernard Buttmann plays ‘Wachet auf’ on the Link organ in the Pauluskirche, Ulm, taking the lovely Fugue at a good lick and making the most of the fine Halleluja; and Graham Barber plays ‘Halleluja! Gott so loben’ on the Weimbs organ at the Michaeliskirche, Weiden – the Fugue is almost jazzy and it reaches a tremendous climax, crowning the whole opus. Will Fraser sets the cameras so that we see all three organists from the left but also from the top: not only are we shown their hands but also their feet on the pedals. The chorale texts are printed as captions, each line in its correct place, which is an aid to enjoyment, and the performances set the bar very high for what is to come. Disc 2: The Hyperion Trio introduce me to the Largo of 1889, a nice late Romantic piece very pleasingly played. Songs performed by Frauke May and the pianist Bernard Renzikowski are scattered through the disc: this duo have recorded a number of Reger’s Lieder, including the complete Op. 76, and their renderings feature glowing tone from the singer, sensitive playing from the pianist and excellent ensemble. Piano pieces are contributed by Andrew Brownell, Oliver Kern and the superb Markus Becker, who has recorded all of Reger’s output magnificently: he shines out from the other pianists whenever he appears. Organ pieces include the impressive Passacaglia from the Suite, Op. 16 (Barber); the Fantasy on ‘Freu’ dich sehr’, Op. 30, which Buttmann keeps moving right up to the terrific ending; the Symphonic Fantasy & Fugue, Op. 57, also given a fine performance by Buttmann with a tremendous Fugue; and some of the Op. 59 set, shared between Barber and Buttmann. The young Aris Quartet play the A major Quartet, Op. 54/2: the violin tone sounds a little thin but this is a delightful, committed reading of a buoyant, airy work. Disc 3: The documentary continues with a fragment of the String Sextet and other intriguing snippets. We hear that Reger set 13 of the same poems as Strauss in his Lieder, something I had not noticed before. His uneasy relationship with the critics is exemplified by his 1904 Violin Sonata in C major, Op. 72, with its use of the notes (in German notation) AFFE (ape) and SCHAF (sheep), of which we get a preview. The Variations & Fugue on an Original Theme is said by its performer Barber to be the most modern work he wrote – we are shown some of the score, with its profusion of red expression marks. Will Fraser, who writes and narrates the links, speaks of ‘a diary of the self’ in Reger’s works; and Haas points out that at this stage, Freud was producing his first writings. We see the Aris Quartet playing some of the opening movement of the massive D minor Quartet, Op. 74: they play another extract on Disc 5 but sadly we do not hear even one complete movement of it. The point is made that Reger participated, Janus-like, in both the Baroque revival and the modernist tendency. Popp and Levin look at his use of sonata form and the way he made it over-complicated. Performances on this disc include Barber and Buttman in six of the Op. 65 pieces; Barber in five of the Op. 67 pieces on chorales; Haas and Buttmann in two from Op. 69; and Haas and Buttmann in three from Op. 80. Levin conducts the Brandenburg State Orchestra in his own orchestration of the Bach Variations, Op. 81, one of the few exercises in the set which I find redundant. He does the job neatly and conducts it tidily enough, but he cuts four variations. In the documentary section he argues that Reger did this sort of thing when transferring a work from one medium to another. Yes, but it was his own music that Reger was altering. I always find it puzzling when someone feels the compulsion to orchestrate someone else’s music, as if there is a sort of hierarchy in which the orchestra ranks higher than the piano. I would rather the space and effort had been devoted to genuine orchestral Reger, perhaps A Romantic Suite. Disc 4: A number of songs are well performed by May and Renzikowski, including Reger’s setting of Morgen and four from Op. 76, among them the delectable Zwei Mauschen and Reger’s ‘greatest hit’, Mariä Wiegenlied. Sayaka Shoji and Julien Quentin play two Romances for violin and piano, the G major from 1901, very nicely done, and the 1905 one from Op. 87, pleasantly negotiated for the most part although Shoji produces some rasping G-string tone. The revelation is the interpretation of the AFFE-SCHAF Sonata by Egidius Streiff and Alessandro Tardino, which makes me take the work much more seriously. Streiff has the ability to seek out Reger’s little passages of wistfulness or nostalgia in the opening Allegro con spirito, and Tardino backs him to the hilt. The sprightly, witty Prestissimo has a heartfelt slower Trio; the Largo is inwardly played; and the Allegro con brio brings more wistful and witty touches. In all, it is a lovely performance. These artists also give us the three pieces of Op. 79d, very fine; and on his own Streiff gives a magnificent rendering of the B flat Sonata for solo violin, Op. 91/3, throwing off nifty staccato along the way. The last of the three movements incorporates a Bach quotation. Barber switches to the Sauer organ at the Lutherkirche, Chemnitz, for the Variations and Fugue on an Original Theme, Op. 73: there is a marvellous toccata-like variation amid a wealth of invention, and Barber finds a good tempo for the mighty Fugue. The Bach Variations are played in their correct form by the solidly competent pianist Rudolf Meister, with a sturdy Fugue. I do miss the more mercurial touch of Markus Becker, who is allotted two pieces from Aus meinem Tagebuche, Op. 82. These are arrangements of movements from the First String Trio and, well as Becker plays them, I would far rather have the entire String Trio, one of Reger’s most magical creations. Becker is on safer ground with the D major Sonatina, Op. 89/2, a delight from beginning to end. The Aria from the A minor Suite, Op. 103a, which exists in several instrumentations, is beautifully played by the cellist Julius Berger, with Oliver Kern. Disc 5: We enter Reger’s Meiningen period. His conducting is discussed and we hear him playing the organ, via an organ roll. 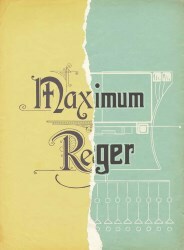 Haas says that people today perform Reger too correctly – it may even be better to play him a little incorrectly. Barber suggests that writing Preludes and Fugues at this time in history was an expression of hope. The astonishing ‘Dies Irae’ from the unfinished Requiem makes a great impression – what a pity his friend Karl Straube dissuaded him from completing the work. Haas quotes Alban Berg on the irregularities in the compositions of both Schoenberg and Reger; and Dr Popp says the latter combined intellect and emotion. Will Fraser’s take on him is ‘conservative form but radical content’, a good summation in my view. Complete performances include the leader of the Aris Quartet, Katharina Wildermuth, and pianist Evgenia Rubinova playing the complete Op. 103a Suite splendidly in its violin version – apart from the Aria, it features five more charming movements and ends with a Gigue. Berger and Kern tackle the big A minor Cello Sonata, Op. 116, very convincingly, differentiating its shifting moods. Shoji delivers the G minor Prelude & Fugue from Op. 117 quite well. Finally we hear the String Sextet, Op. 118, complete, with the Diogenes Quartet joined by Roland Glassl and Wen-Sinn Yang, an exemplary reading. Disc 6: Frauke May gives a lovely performance of the large-scale orchestral song An die Hoffnung, Op. 124, a superb Hölderlin setting fit to be mentioned in the same breath as any of Mahler’s similar pieces: Wayne Marshall conducts the excellent WDR Funkhausorchester. May also sings Reger’s last, very simple, song, Bitte, with Renzikowski. Bernhard Haas takes to the Sauer organ of St Petri Dom, Bremen, for the massive Introduction, Passacaglia & Fugue in E minor, Op. 127: it is a magisterial performance, with the great Fugue given full value. Then we return to Ira Levin and the Brandenburg State Orchestra for one of Reger’s best orchestral works, the Four Tone Poems after Arnold Böcklin, Op. 128: this is a fine exposition of the differing pieces, with leader Klaudina Schulze-Broniewska a splendid soloist in ‘Der geigende Eremit’, but it would have been helpful to have the four Böcklin paintings on screen. Conductor and orchestra also give a good account of Reger’s orchestration for strings of Bach’s BWV 622, ‘O Mensch, bewein dein Sünde gross’. Does it add to our knowledge of Reger? Not really. Buttmann offers two pieces from Op. 129 and Barber – at the Chemnitz instrument – performs both the shorter (authorised) and longer (manuscript) versions of the Fantasy & Fugue in D minor, Op. 135b. Again, I am unsure of the benefits of this doubling up. Markus Becker gives great pleasure with the Molto adagio, Op. 143/3; and Roland Glassl is superb in the first and best of the Suites for solo viola, Op. 131d, the G minor. I hope I have made it clear that there is an enormous amount of worthwhile music, in worthy performances, in this set of DVDs. Organ pieces abound, and if I were starting such a project from scratch, I would include a little more chamber music: I have already mentioned the First String Trio but the E flat String Quartet, the Clarinet Quintet or one of the flute Serenades would have helped to lend variety. Anyone who goes through the set systematically will form his or her view of Reger’s output. My own opinion is that only Elgar surpassed him in his great years, 1901 to 1916 – and yes, I am aware of the other opposition! Dr Popp comments that Reger did not found any school, even though he had 300 pupils. That is strictly true, but he had a huge influence on the compositions of Adolf Busch, Karol Szymanowski, Josef Suk I, Arthur Honegger, Paul Hindemith and many others who did not study formally with him. I am sorry that no mention is made, in the documentary strands, of the great Reger interpreters such as the Busch brothers, Marteau, Kwast-Hodapp and so on. This glorious, occasionally frustrating composer certainly deserves this tribute; and newcomers will find that once they get on to his wavelength, his harmony will enter their bones. The booklet is handsomely produced, with photos of all the artists and several pictures of Reger. It functions as a complete listing of his compositions, with the works that are performed picked out in bold type. It would have been useful to have movement timings but organ enthusiasts will find the specification of each instrument listed. The attractive packaging reproduces some of the famous drawings of Reger conducting, among other pictures.